This is the first of another series of articles we are creating at GMI to give you good reason to come back time and time again. We round up all the best videos on guitar gear that you can drool over. So, without further ado, let’s see what the guys have to say about the Line 6 Helix Native plugin and how to get the best from it. Joe Gore crafted the unorthodox presets showcased here, using the Helix Native Plug-In’s sophisticated multi-effect and signal-routing capabilities. How to get the most processing power out of a single instance of Helix Native. 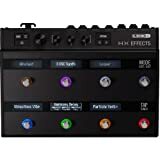 If you are not sure what the Line 6 Helix Native does, here is a review setting out exactly what you can do with it.